This is my absolute favorite time of year…when it is well and truly summer. Time for swimsuits and running through the sprinklers and for me, time for the sunflowers to bloom. I watch expectantly every June for the first sign of color on my sunflowers. For when they bloom, I know summer is really here and the squash and tomatoes will ripen very soon. Today has been a rainy summery day. A nice summer rain is so purifying. It cleans everything, and even though, it is blah and gray today, I know that tomorrow everything will be shiny green and so crisp and clean looking after the washing the rain gives. 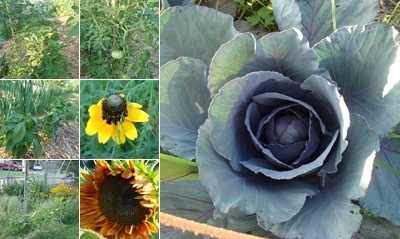 I have pictures of my first sunflowers and a few other things from my garden. Hope you enjoy seeing my garden as much as I enjoy sharing it with you. Happy gardening! I keep trying to get out to the garden to work, but the weather has cooperated only sporadically. I managed to plant some cabbage and onions a couple of weeks ago. So far so good, if they dont rot from all the rain and snow! I have my potatoes sliced and waiting for some dry weather to get them in the ground. This year I am planting All Blue, French Fingerling and Red Gold. The girls have already noticed the different colors these offer, so I am very excited about growing them. Pray for warm, sunny weather, so we can actually get our gardens planted. Happy Gardening!